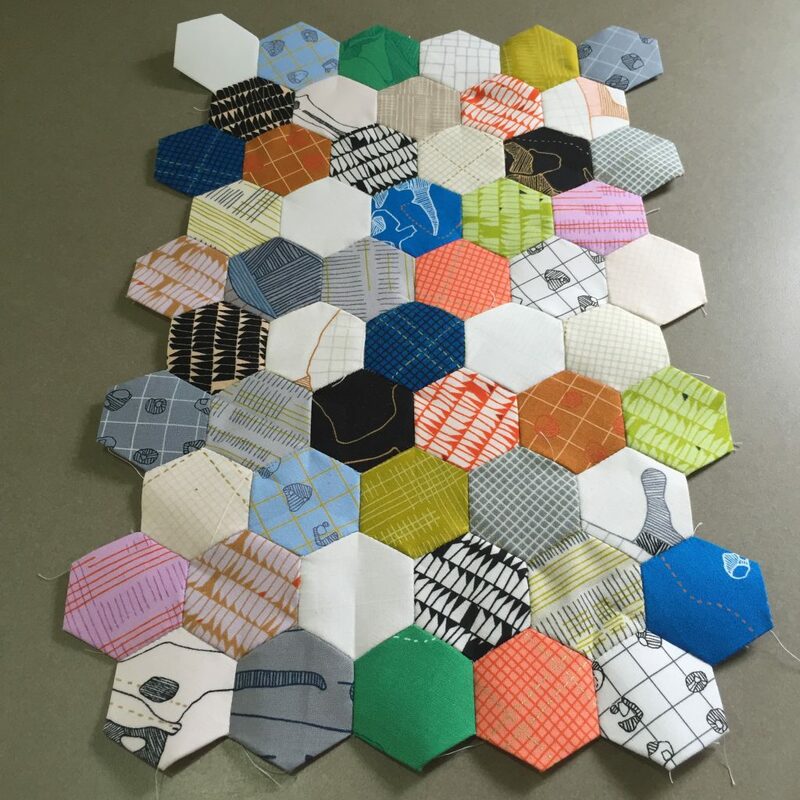 the great hexie quilt of 2016.
before we left for the first leg of the lidbom rambling road show, i purchased a bundle of carkai by carolyn friedlander. i determined that it was my christmas present, and i had no idea what my plan was, since i wasn’t going to be taking my sewing machine on the trip. but i loved it. 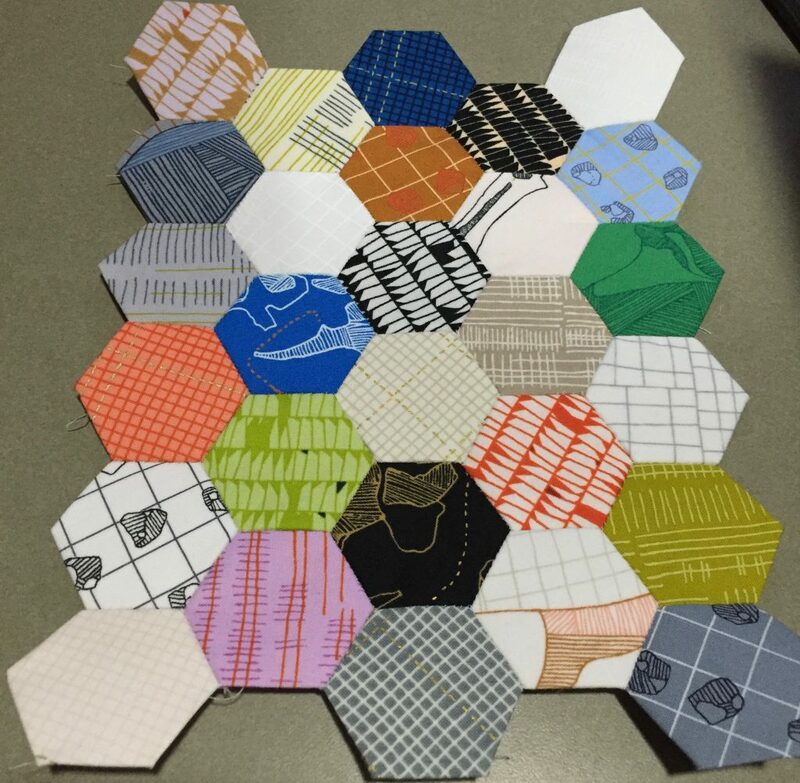 i decided that my best (and most brainless) option was to make hexies and just hand sew them together randomly. 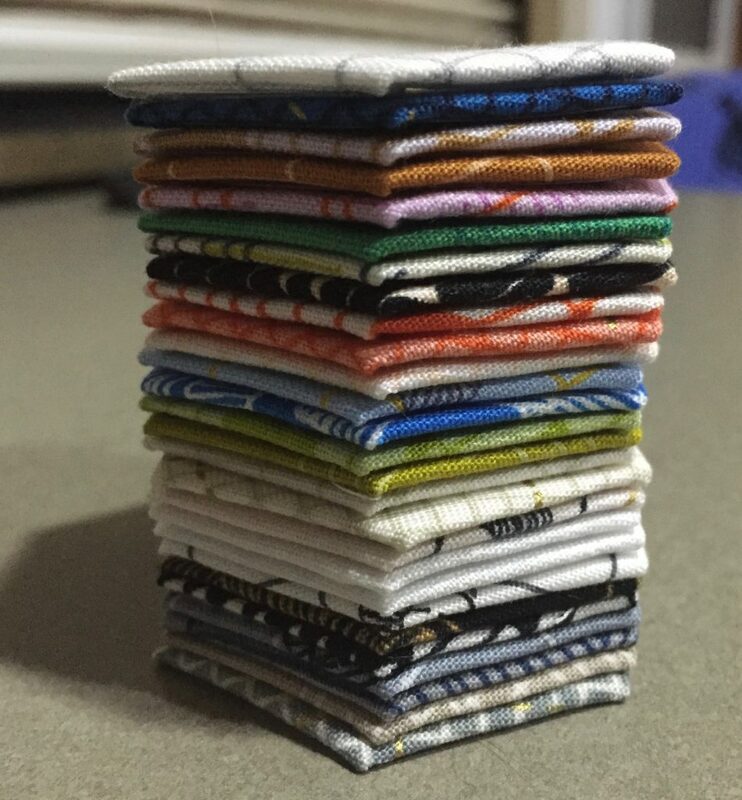 i sewed that first set together and i was in love. and i was also realizing that this was going to be quite an undertaking. five sets. and you probably didn’t notice that the background of the pic is the old kitchen table at the house. here’s what that means. 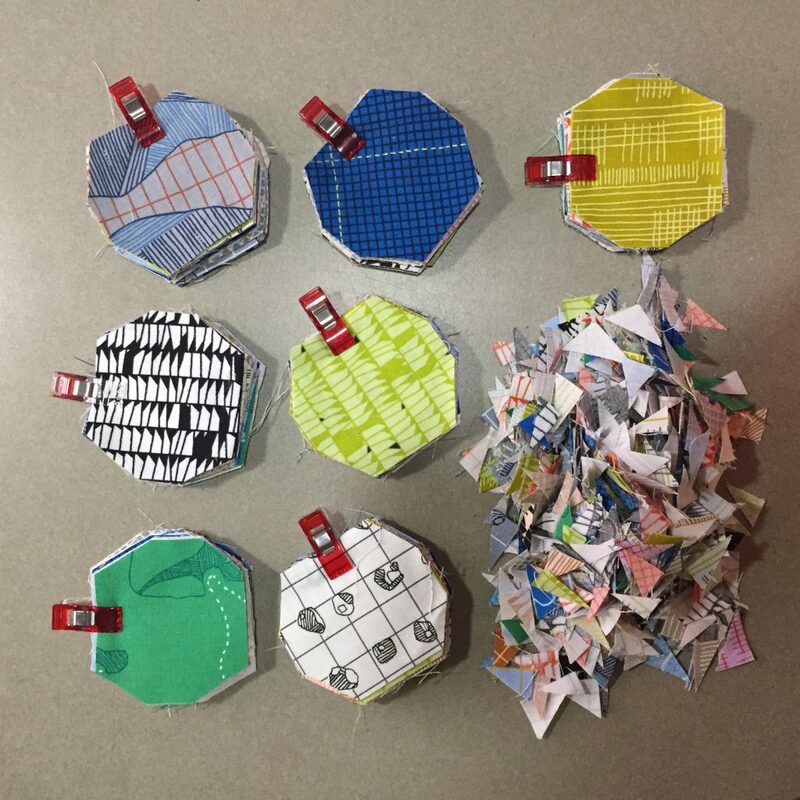 in our 6 week trip, i sewed five sets of 28 hexies together. that’s 140 hexies. 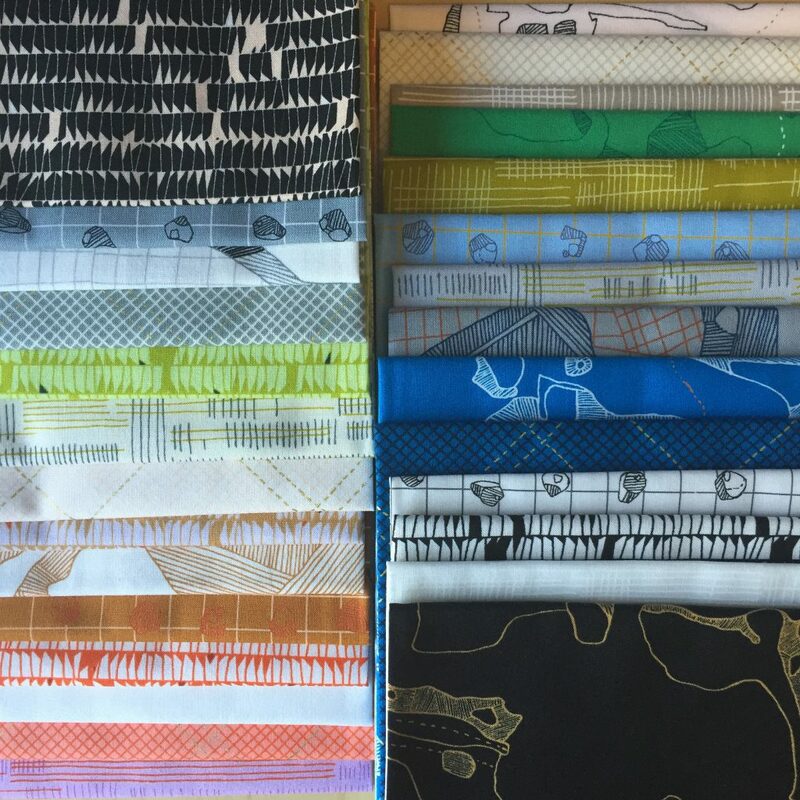 i predicted that this project would take about 12 years and debating just making a pillow. 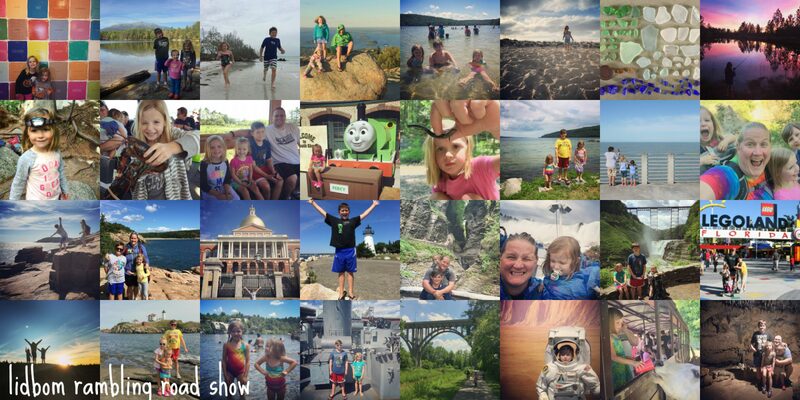 in the last two months of the trip, i made tons of progress. 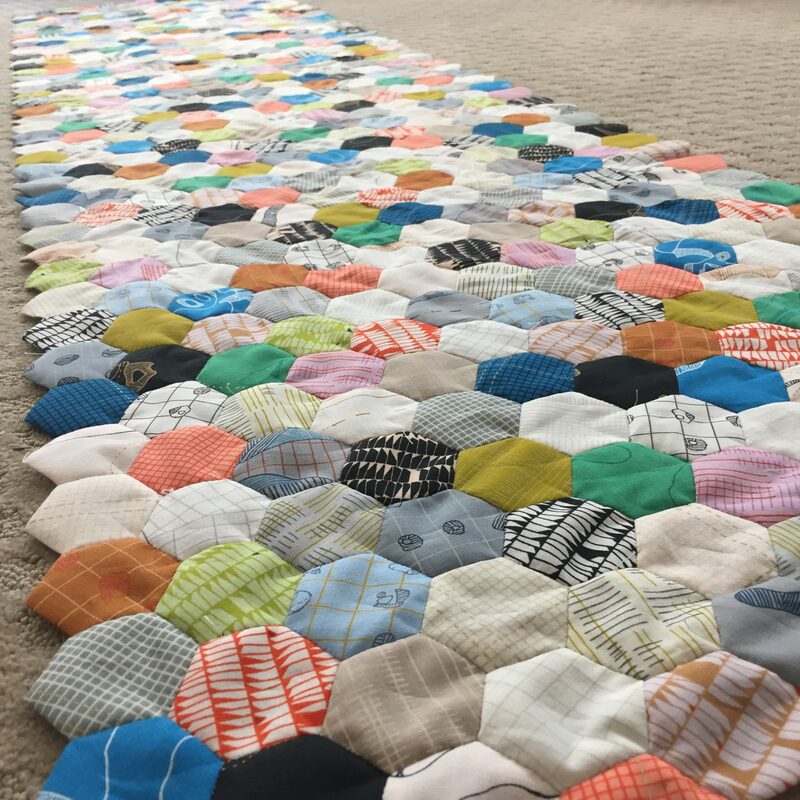 i ended up with a 19″ x 80″ strip of 585 hexies. 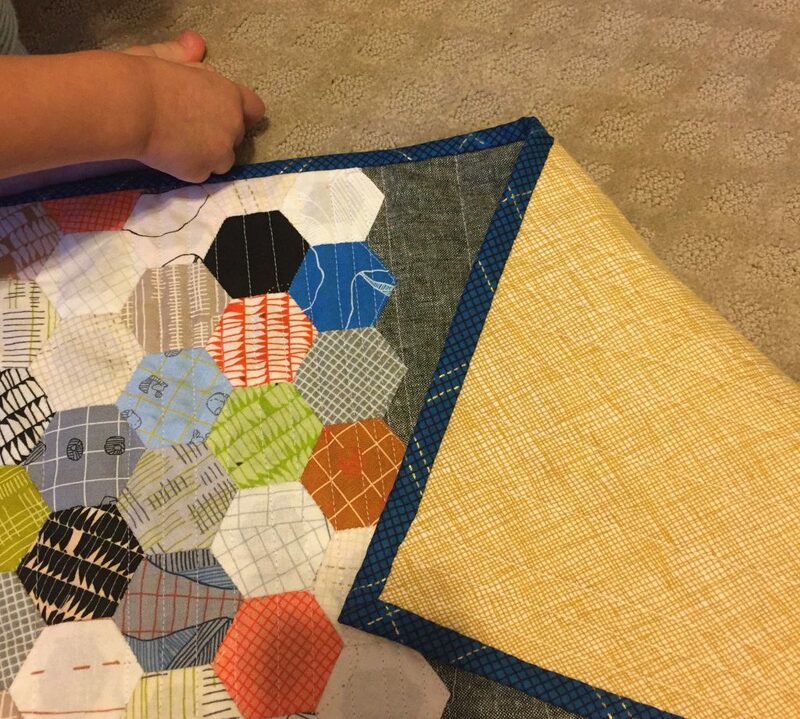 when we arrived home (or derek’s parent’s home, that is), i was on a mission to get it quilted. 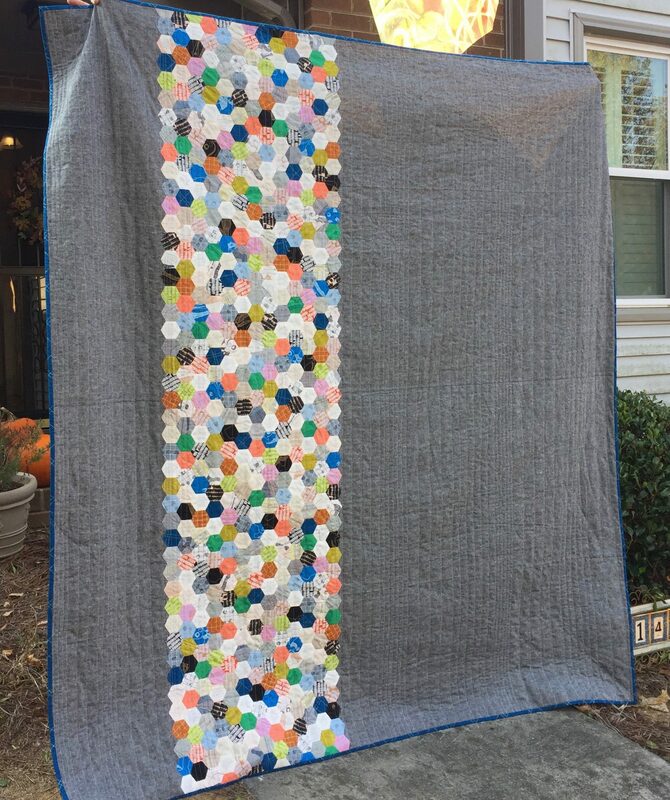 i stopped by some fabric shops and picked up some essex yarn dyed linen for the background and some 108″ friedlander backing fabric. 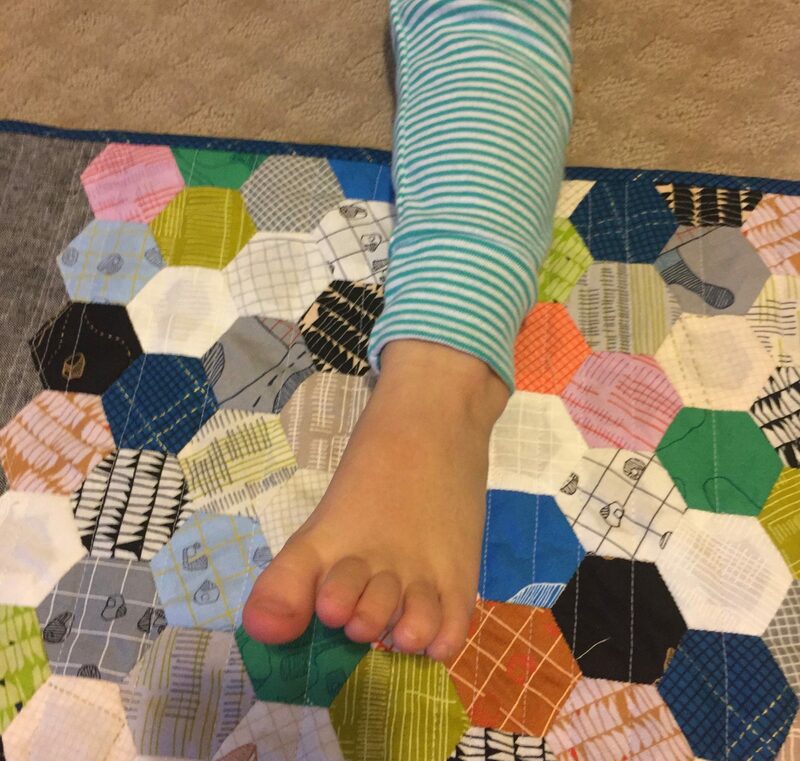 then, during a long sewing day at my fave quilt shop, sewingly yours, i got this beast quilted. i bound it in this blue cross hatchy print from the same line and i was in love. hazel too. of course, upon completion, i made derek model it for me. seriously. i couldn’t love it more. 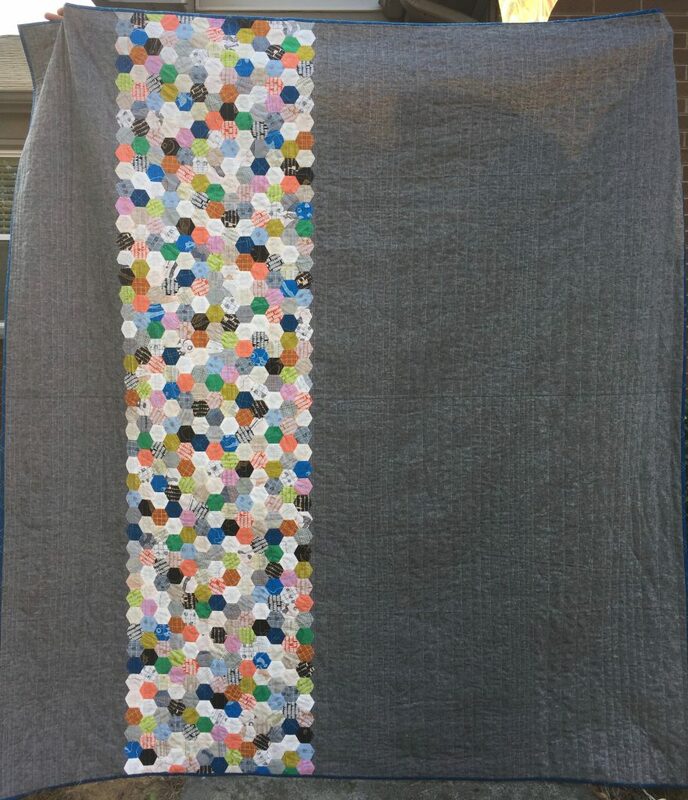 my original plan was to quilt horizontal lines. but i was worried about keeping them straight. 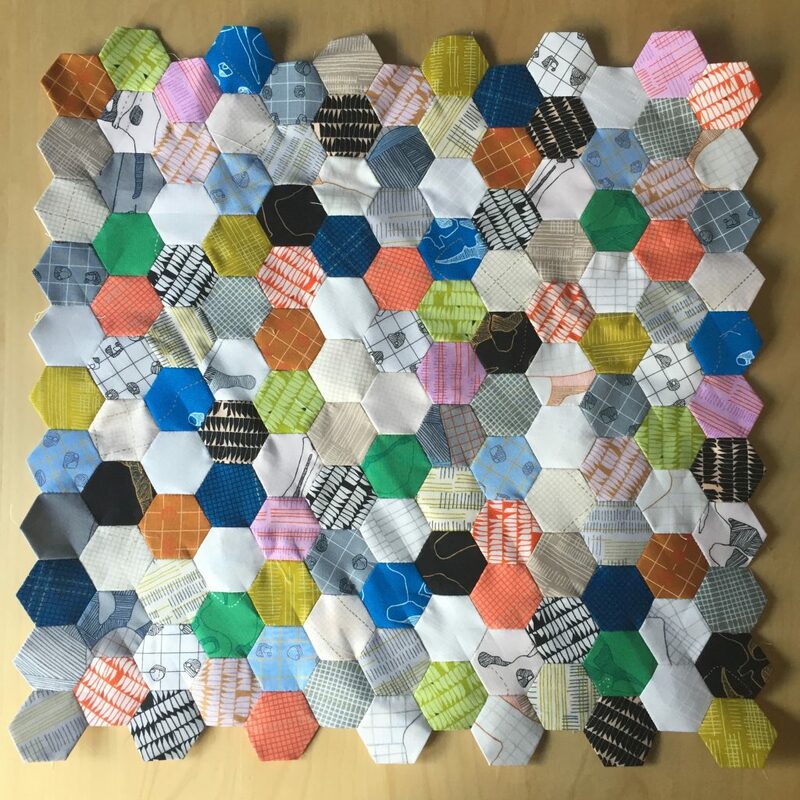 because my hexies weren’t as good a guide that way. so, i decided i would do a grid. but of varying width lines. so like a plaid pattern. i started with the verticals. and it took soooooo long. so i just did vertical. and i actually like it. 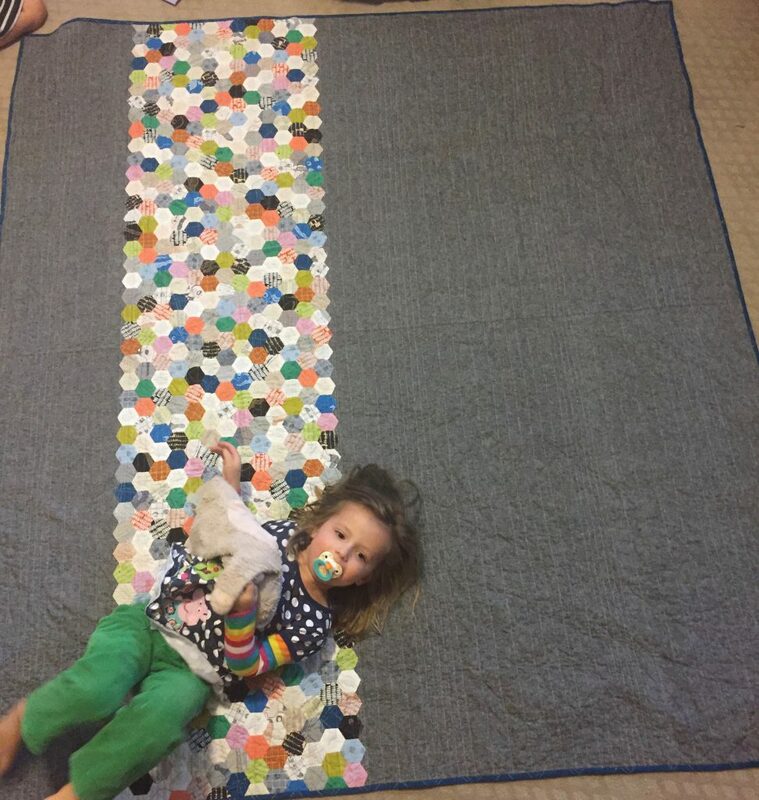 when i spread it out, hazel asked “can i roll around on it” so obviously i let her and obviously i took pics. 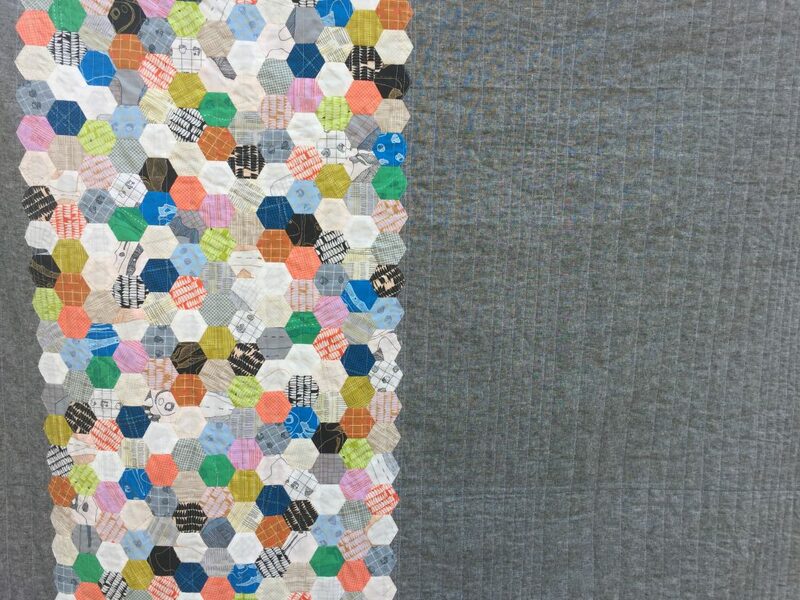 so, that’s the story of the roadshow quilt. hopefully my machine will be making the trip on the next leg. i’ve missed the old girl. and hate hand sewing. So insanely cool! 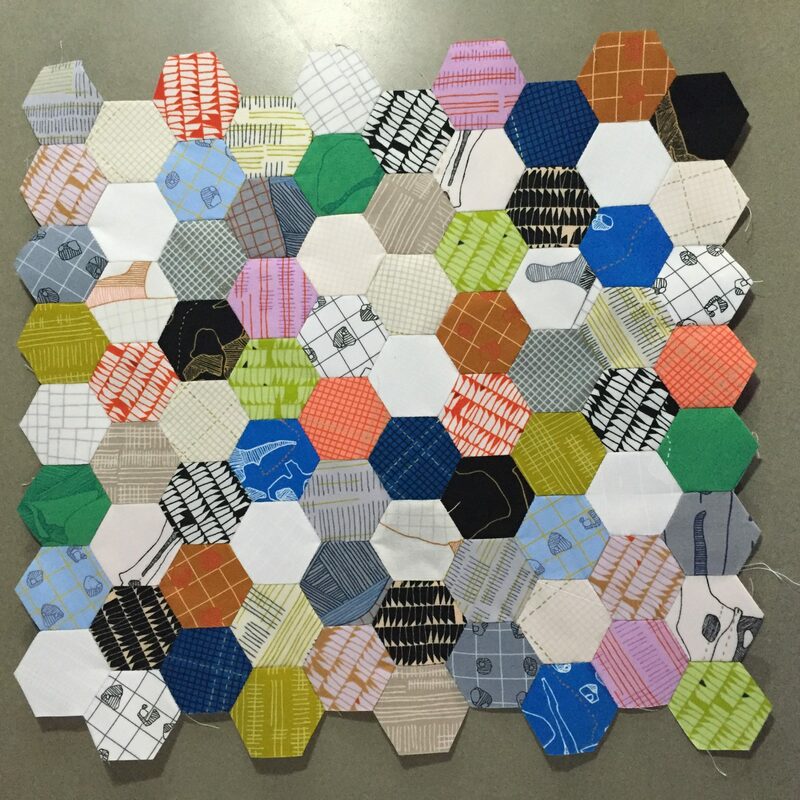 Love the hexie quilt!